One of my all time favorite radio actresses! Amazing! One of the coolest things is hearing familiar RMT actors on other radio shows....Sometimes they are younger, sometimes older... Listening to an early Shadow I recognized a voice right away in the second one on my series...Have heard them on many other shows too. I found it hard to recognize Virginia Gregg's voice on a show. She changed her voice and character so often, I only knew I was listening to a great actress. That would clue me in to the thought that it must be Virginia Gregg, my all time favorite actress on radio. Ms Gregg was so prolific--we saw her on TV's "Dragnet" so much we thought she was Jack Webb's mother. Said in jest//the hardest thing for an actress is to get beyond one's vanity and play the harder edged roles. Virginia Lee Gregg (March 6, 1916 – September 15, 1986) was an American actress known for her many roles in radio dramas and television series. 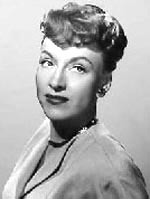 Gregg was a prolific radio actress, heard on such programs as The Adventures of Sam Spade, Dragnet, Dr. Kildare, Gunsmoke, The Jack Benny Program, Let George Do It, Lux Radio Theatre, One Man's Family, Yours Truly, Johnny Dollar, The Screen Guild Theater, The CBS Radio Mystery Theatre, The Zero Hour and Mutual Radio Theater. On Film, Beginning with Body and Soul (1947), Gregg made more than 45 films, including I'll Cry Tomorrow (1955), Love Is a Many-Splendored Thing (1955), Portland Exposé (1957), Operation Petticoat (1959), All the Fine Young Cannibals (1960), Man-Trap (1961), House of Women (1962), Spencer's Mountain (1963), Two on a Guillotine (1965), A Big Hand for the Little Lady (1966), The Bubble (1966), Madigan (1968), Heaven with a Gun (1969), Quarantined (1970), A Walk in the Spring Rain (1970), No Way Back (1976), and S.O.B. (1981) She gave voice to Norman's mother in the Psycho films On television, Gregg appeared in nearly every narrative television series in the late '50s through the early 1970s, including Bourbon Street Beat, Hawaiian Eye, 77 Sunset Strip, The Rockford Files, The Virginian, Alfred Hitchcock Presents, Wagon Train, Trackdown, Make Room for Daddy, Philip Marlowe, My Favorite Martian, Twilight Zone, Hazel, Kung Fu, Gunsmoke, Bonanza and Perry Mason. Gregg may be best remembered for her many appearances in Dragnet. Jack Webb used her in dozens of roles on both the radio and TV versions of the show, as well as in the 1954 film version of Dragnet.In later years, she appeared on other shows produced by Webb's production company, Mark VII Limited (e.g., Adam-12, Emergency!) She voiced "Tarra" on the 1967 animated TV series The Herculoids. She reprised that role when the series was revived in 1981 as part of the Space Stars animated series. Virginia Lee Gregg (March 6, 1916 – September 15, 1986) was an American actress known for her many roles in radio dramas and television series. Before going into radio, Virginia played the double bass with the Pasadena Symphony and Pops. She was a member of the Singing Strings group heard initially on KHJ in Los Angeles in 1937 and later on CBS and Mutual. Gregg was a prolific radio actress, heard on such programs as The Adventures of Sam Spade, Dragnet, Have Gun–Will Travel.Dr. Kildare, Gunsmoke, The Jack Benny Program, Let George Do It, Lux Radio Theatre, One Man's Family, Yours Truly, Johnny Dollar, The Screen Guild Theater, The CBS Radio Mystery Theatre, The Zero Hour and Mutual Radio Theater. On Television you many have seen her in episodes o nearly every narrative television series in the late '50s through the early 1970s, including Bourbon Street Beat, Hawaiian Eye, 77 Sunset Strip, The Rockford Files, Maverick, The Virginian, Alfred Hitchcock Presents, Wagon Train, Trackdown, Make Room for Daddy, Philip Marlowe, My Favorite Martian, Twilight Zone, Hazel, Kung Fu, Gunsmoke and Bewitched,Bonanza. She portrayed Jessie Copperton, a domineering cattle ranch matriarch, on Season 14; Episode 15 of Gunsmoke, entitled "The Twisted Heritage", in which her character has designs on welcoming Miss Kitty (Amanda Blake) into the family as a replacement for her former daughter-in-law. Gregg may be best remembered for her many appearances in Dragnet. Jack Webb used her in dozens of roles on both the radio and TV versions of the show, as well as in the 1954 film version of Dragnet. In later years, she appeared on other shows produced by Webb's production company, Mark VII Limited (e.g., Adam-12, Emergency!). Gregg also played non-recurring character roles in four episodes of the long-running CBS series Perry Mason, including the 1958 episode, "The Case of the Cautious Coquette," and "The Case of the Pathetic Patient" from 1961. Her Voice can be heard in... Gregg supplied the voice of "Mrs. Bates" in Psycho as did Jeanette Nolan and Paul Jasmin, all uncredited. Only Gregg did the voice in the sequels Psycho II and Psycho III. She voiced "Tarra" on the 1967 animated TV series The Herculoids. She reprised that role when the series was revived in 1981 as part of the Space Stars animated series.